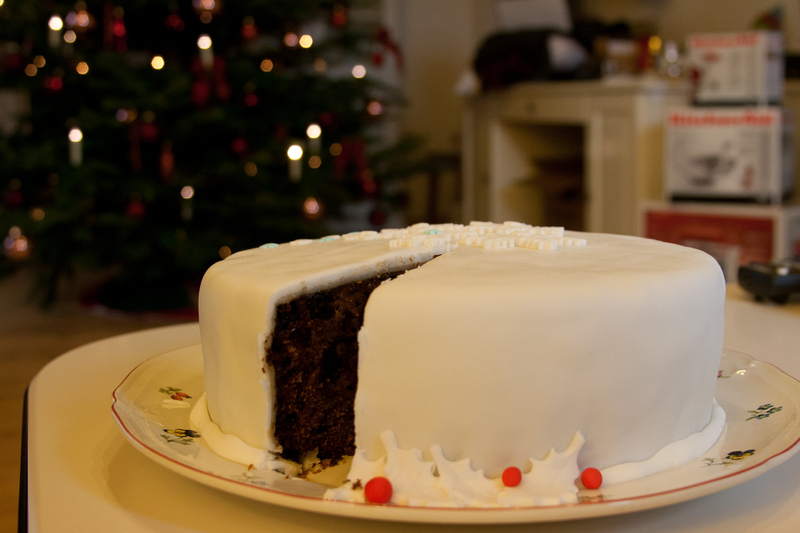 This Christmas cake is just perfect to decorate with fondant as it is really solid and you can work pretty good on that. Just check whether your cake is evenly baked, otherwise cut away pieces of cake which stands out and fill little gaps with a bit of marzipan. 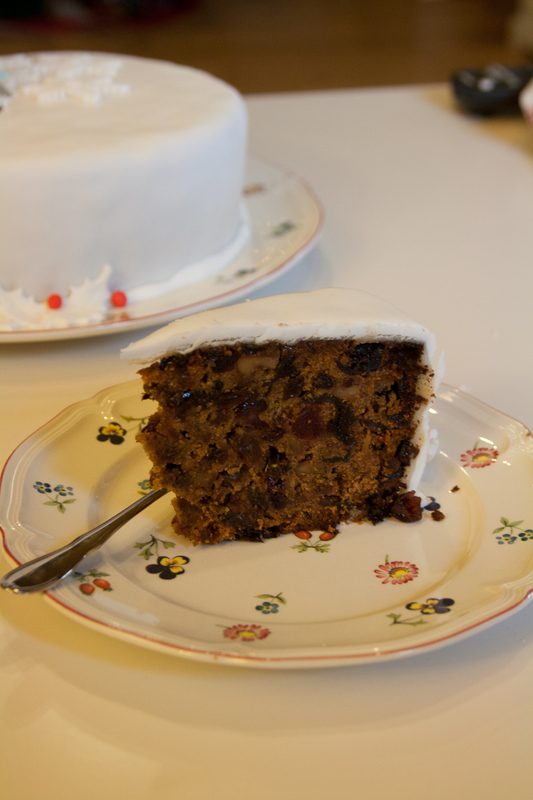 Once you have an even cake, coat it with marzipan. Sometime you can buy already rolled marzipan, if you can’t find it just roll it on a surface dusted with icing sugar and also don’t forget to dust your rolling pin as well! Otherwise the marzipan may stick to it and break. Heat up some apricot jam (or better jelly as it has no pieces in it) and brush it all over the cake, followed by the marzipan. Make sure it does not brake and that you can make an even surface. If you do not have any special tools, just dust your hands with some icing sugar and rub on the marzipan surface until it is even and sticks to the cake. Trim of any excess marzipan. Finally layer the cake with the fondant. Prepare and handle the fondant as you did with the marzipan. Now the cake is nicely covered and ready to be decorated. Use your imagination and create whatever you like. 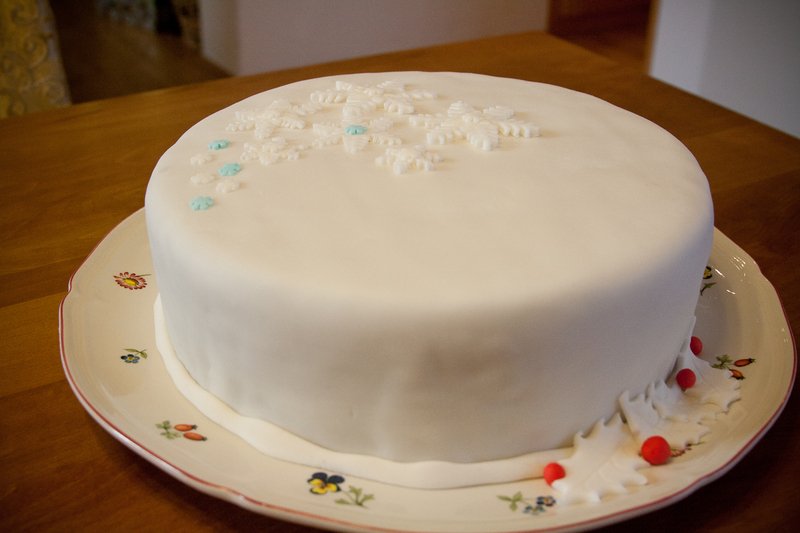 I wanted to keep it simple and somehow elegant so I used only a few snowflakes highlighted with small blue snowflakes. I had a special plunger cutter for fondant but you can use any cutter you want or even make your own little Christmas figures 🙂 Have fun!